Church of the Big Sky: Roku, how I love thee! Have I mentioned how much I love my little Roku machine? Yes, the initial investment set me back a little under $100, but if you're on a short financial chain, but love movies and music, it's a godsend and worth turning a trick or two to buy. I have my $10 (well, $9.53) one-DVD-a-month Netflix account, which comes with all-you-can-eat viewing from their instant play menu. And there are so many other free channels I get (my Pandora stations, Radio Paradise, etc.) - man I love it! Today, I added the freebie mp3tunes.com to my Roku line up. Right now, I get 2GB of free "locker" space for music and videos from my iTunes account that I can now listen to/watch through the TV. When you sync your Roku to mp3tunes.com, you get an invite for an upgrade to 10GB of freebie iTunes locker space. That's a nice pile of your hand-picked songs for a party or a day of lounging with a book. Sweeeeeet! I got one of my sisters hooked on Roku, and she's got her own little black box now. It's addictive pleasure for shallow-pocketed pop culture freaks. Really, it's heaven. I have so many foreign films lined up to watch, I could run my own art house cinema. 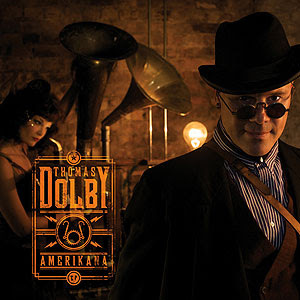 And right now, I'm listening to brand spankin' new Thomas Dolby music through my TV. Ah, technology! Sometimes you really are grand! And hey, kids - if you haven't heard Mr. Dolby's first new studio music in 20 years, it's time to hie yourself over to his website, join his forum, and then, for $2.99, you can revel in some gorgeous and fun new tunes. Seriously - go get his new "Amerikana" EP. It's an exclusive download (with swanky digital booklet!) for registered members of his official forum, the Flat Earth Society. Three killer tracks for less than a Starbucks coffee, folks! Once you hear "17 Hills," I guarantee you will be hooked on Dolby music all over again. Go! Now! Get new music! Fall in love! And if you don't have one, consider a Roku. Brilliant item. And, no, they're not paying me to express my love for the little black box. It's just another awesome thing that I think you should know about it and get for yourself. And now, back to the sofa and my "Veronica Mars" Season One Netflix marathon. Ahh, air conditioning, the La-Z-Boy, a pitcher of ice water, and good TV. On a hot summer night, that's all you need. 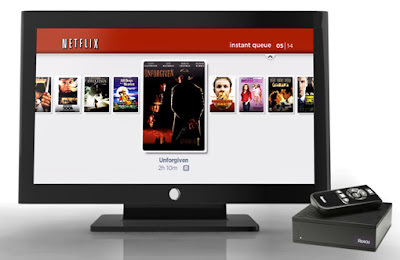 I have a similar Netflix membership but so far I've just been watching the streaming stuff on my computer or lappy. I have been thinking about getting a Wii to stream it on my big TV though.